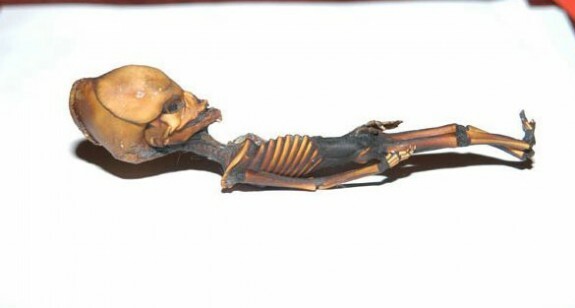 Open Minds TV has done some considerable background work on the Atacama Alien Humanoid, tracing its original discovery to the ghost town of Atacama in Chile, its travels, changes of ownership and previous analysis. We’ve discovered since a number of things, including the original 7 minute TV program about the case aired by Chile’s Megavisión Channel V shortly after the creature’s discovery was published in the local press. You can now see this program on YouTube in Spanish, and it shows exactly the location where the creature was discovered, as well as interviews with Oscar Muñoz, the man who found it, Alejandro Dávalos, the first one to photograph the being, and well known Chilean ufologist Rodrigo Fuenzalida, director of the AION UFO research group. Okay, this is a spoiler alert. 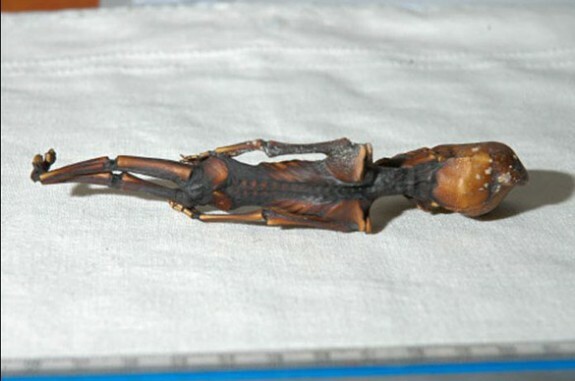 I have not seen the Steven Greer Documentary Sirius that Xavier reported on earlier, so cannot say what results are described therein, but if you read further there is a conclusion given as to the nature of this little body. So if you don’t want to know, read no further. Navia-Osorio provides the text of two scientific documents in his report. The first one is the “radiological” report signed by doctors E. Feijoo, C. López and J. M. Colomer. It basically consists on a detailed description of the creature itself but it obviously avoids giving any conclusion about its origin. It is clear from this report, however, that the creature is not a crude hoax as was cavalierly suggested by a Complutense scientist who suggested (while remaining anonymous) that the whole thing was a hoax made with bird bones. The final part of Ramón Navia-Osorio’s long article describes briefly how Dr. Steven Greer became involved in this case. The link was made by Dr. Bravo, a female doctor from Dallas, who brought Dr. Greer to the IIEE office in Barcelona. The Spanish researcher mentions here some of the claims contained in the promotional material released by the producers of the Sirius documentary, including DNA sequencing which allegedly found the Atacama being had an “unknown classification.” Until we see the film, we can’t judge how valid is the scientific evidence presented. Steven Greer is, on the surface one of the more reasonable UFO believers, I give him that. He has many worthwhile things to say about clean energy and cleaning up the planet. I don’t really care about the debate over global climate change, cleaning up after ourselves is just something we should be responsible for regardless of the impact we may or may not have on our own environment. When it comes to his theories on Aliens, I have yet to see a single piece of evidence that stands out above the typical believer rhetoric or unsubstantiated anecdotal report. I will still watch the documentary, because the subject interests me but even from these few pictures it should be apparent that the this body is of human origin, and the rumors and urban legend surrounding it are as easily dismissed. The chances that an alien species so closely follows our anatomy are, no pun intended, astronomically high. And don’t forget to visit Lindsay, say HI and Like us on our Facebook Page where you will find more comments and content. Precisely. Other than the shape of the skull, the rest of the figure looks amazingly human.